Victoria awakens outside the Collins manor house (later to be known as the Old House) in the year 1790. She calls Barnabas by name and passes herself off as the new tutor for young Daniel and Amy until she can find a way back to the present. Unfortunately, her strange clothing and mysterious origin draw suspicions from Barnabas’ Aunt Abigail, who is convinced that she is a witch and summons a maniacal clergyman, Reverend Trask. Meanwhile, the actual witch, Angelique, roams free and tries to reignite her affair with Barnabas from years past. She is unsuccessful, and vows to take control of the situation. 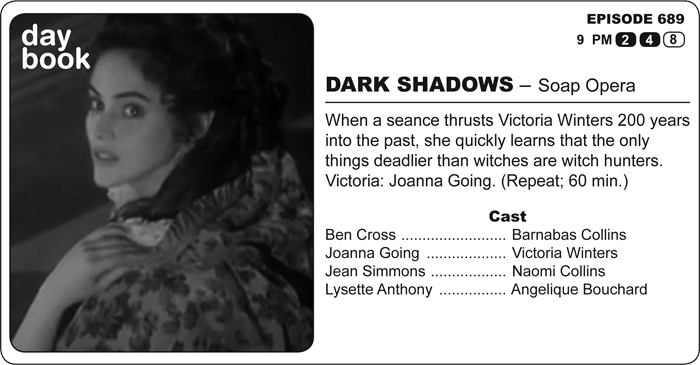 The first to fall under her control is Ben Loomis, Barnabas’ faithful manservant. This episode may be my favorite of the 1991 series. It has a sense of rambunctious enthusiasm and confidence that dominates the screen. When the daytime version goes into its first flashback, you can feel the sense of risk and danger behind what they were pulling off. The revival’s flashback lacks that sense of risk, trading it for a giddy confidence. DARK SHADOWS -- both the broad strokes and details -- had proved itself a lasting success. In the approach to the 1991 series, you can feel that. It has a strange swagger, and the 1791 flashback is Exhibit A. Knowing that Elizabeth would be Naomi, etc, etc, affected the casting with a foresight the daytime series never enjoyed. The double casting of the 1795 sequence feels like a stunt. The 1791 sequence in the nighttime show is clearly a choice. It’s where Dan Curtis reveals, if anything, the real program. Really, for such a young series (or young incarnation of a series), everything works. Making Barnabas, Peter, and Jeremiah a triumvirate of dear friends was a warm touch that humanizes the sequence immediately. The characters are well-drawn, anyway, and they serve as revealing foils for Barnabas. Barbara Blackburn and the writers find an entirely new way to make Millicent a nightmare. Stefan Gierasch’s Joshua is a stingy prig trying desperately to forget that he has a decent, loving heart. Lysette Anthony does all she can with Angelique, but this is the one misfire of the sequence. For all of the evil of Lara Parker’s Angelique, I believed that the love was genuine, and I saw traces of kindness whenever her mask would slip. Anthony goes a far more one-dimensional route, and the results are not the success they should be. Oddly enough, I love the snarling, long-haired zealot Trask played by Roy Thinnes. Both Jerry Lacy and Thinnes are forces with which to be reckoned, but in Thinnes case, I fear he might bite my fingers off while sending Vicki to the gallows. At this time, the Gulf War had done its damage to the ratings by incessant preemptions, the Soviet Union was falling from within, and SILENCE OF THE LAMBS was a box office champion.